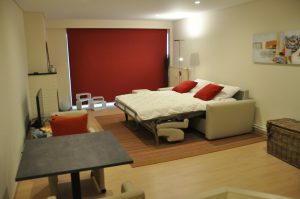 The Escapade has a lot of advantages to make you feel at home immediately. 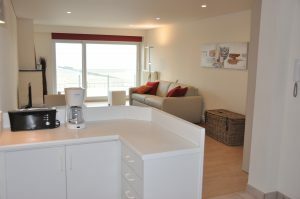 A magnificent seaview from the moment you enter and a feeling of space and light. 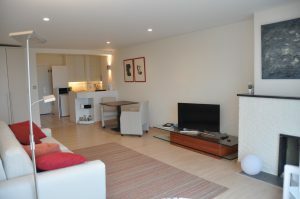 Situated at only 50 m from the tram stop you can get to the center and the railway station in only 10 min. 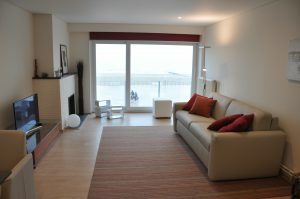 Ideal location to visit the Belgian coast or Bruges by using public transport. The Escapade was decorated with an eye for comfort and conviviality and offers plenty of space. No hassle with furniture to create a place to sleep: a modern and high-quality leather sofa is easily changed into a comfortable double bed with a mattress of 1m60. A cot is also available. Blackout blinds offer instant atmosphere and intimacy. Free Wifi and a flatscreen television are installed. Enough space to arrange your personal belongings. The studio has an open kitchen, fully equipped with dishwasher, oven, microwave, fridge with separate deepfreeze area and all the necessary kitchen utensils you might need to prepare your own meals. 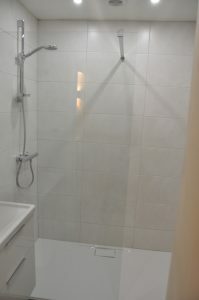 Completely renovated bathroom , shampoo and other toiletries are free. Hair-dryer is also available. Although a walk on the beach of 30 min will take you to the center of Oostende, the nearby tram stop is a good opportunity to get to the center or the station. If you come by car there are several possibilities of free car parking at a short distance from the apartment. There are shops and plenty of restaurants in the vicinity. I’m looking forward to welcome you in the Escapade Seaside View, a place decorated with love and care to let you enjoy all what our North Sea has to offer. balance + a guarantee of €150 must be paid at the latest 14 days before the start of the holiday. more info in the FAQ’s! Do you have any more questions ?